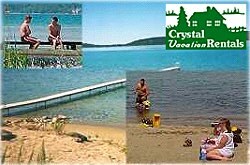 Crystal Rentals rents privately owned “vacation” homes throughout Northwest Michigan. Our rental properties are located in Antrim, Benzie, Grand Traverse, Leelanau and Manistee Counties and include over 70 of the nicest seasonal and year round homes in the region. Choose Lake Front, Lake Access, or River Frontage on a variety of lakes and rivers in the area, including Crystal Lake, Lake Michigan, Big or Little Platte Lakes, Herring Lakes, the Betsie and Platte Rivers; all located in Benzie County. We also have rental properties on other lakes in the region, including Long Lake, Bass Lake, and Silver Lake in Grand Traverse and Leelanau Counties. If you are looking for something closer to town, we have homes in Frankfort, Beulah, Benzonia, Honor and several near Interlochen, Traverse City, and Lake Leelanau. Many of our properties are available year round and are close to Crystal Mountain . . . for the skiers . . . or area casinos if you are interested in some indoor fun.